rejuvenate and restore your skin’s natural beauty. When it comes to facial aesthetics in Santa Monica, you won’t find a personal touch anywhere like you will at Modern Aesthetica. Our clinic does not believe in a “one treatment fits all approach,” and we’re not just trying to sell you our most profitable products. Dr. Daniel Moghadam will work with you to find the treatments that are best for you. We believe a doctor and patient should be a team, working together to help meet your aesthetic goals. We take an exploratory approach, ensuring all our clients’ needs are heard and the proper treatment is recommended. When it comes to your personal wellness and facial aesthetics, you shouldn’t settle for anything less than the best. At our state-of-the-art wellness clinic, our doctor delivers all regenerative and anti-aging healthcare himself. This ensures you get the best possible results from your treatments. When it comes to facial aesthetics, one of the hottest topics is the fabled “vampire facial.” Below we’ve outlined some key aspects about this mysterious treatment and how PRP therapy works to regenerate and restore your body. We believe that your body’s own plasma can provide great rejuvenating benefits for your face — as well as help with joint pain. If you’d like to know more about this procedure please continue on. After that, schedule your free initial consultation with Dr. Daniel Moghadam to see if this revolutionary new treatment is right for you. When it comes to understanding PRP therapy, it’s important to know what exactly makes up the basis for this sort of treatment. PRP stands for platelet-rich plasma. Platelets are a critical part of the makeup of your blood that causes clotting. It also contains beneficial proteins that are called growth factors. These proteins are responsible for promoting and supporting cell growth. Platelet-rich plasma contains a high concentration of these platelets to a minimal amount of plasma. This solution is the key to the “vampire facial,” and it’s what gives it its unique name. Because platelet growth factors play such a critical role in the healing process, PRP treatment can be used for more than just facial aesthetics. In fact, PRP therapy can be applied to joint aches as well. When this concentration of platelets is injected into the injured or damaged tendons, muscles, joints, or ligaments, the growth factors stimulate reparative cell formation. Advanced ultrasound or fluoroscopic technology also takes out the guesswork for the doctor administering the injection. Targeting the right areas with PRP treatments are vital to the recovery process. Celebrities (Tiger Woods has used them and experienced a good measure of success) and our clients alike have used PRP therapy to boost their bodies’ natural healing abilities. For those who suffer from arthritis, PRP treatments can be used to reduce inflammation and even turn the degeneration process around. If your healthcare provider has advised surgery, PRP therapy may be an effective alternative. You can avoid massive costs and invasive surgeries that can leave you laid up for months at a time. If PRP can make such a difference in cell regeneration for other areas of your body, it can also rejuvenate the skin cells on your face and restore your youthful glow. The first step in the process is to draw blood. 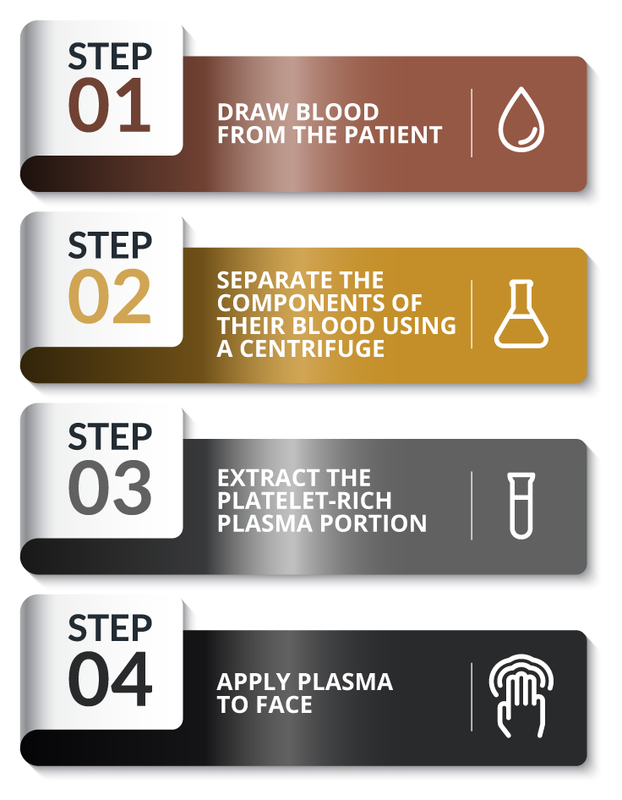 This is as simple a process as you would experience for doing routine lab work or donating blood. Next, the blood is placed into a centrifuge. This device spins the blood at such a high speed that it separates its components (red blood cells, white blood cells, and your plasma). From here, the doctor takes the platelet-rich portion of your blood. This is a quick and easy process which can usually be done in about 10 minutes. At Modern Aesthetica we are completely understanding if the thought of an injection to get a facial done can be quite unnerving. However, our hope is that you won’t let your fears get in the way of this rejuvenating treatment. Applied tension. Practice tensing the muscles in your arms, upper body, and legs until your face feels warm. Stop. Then repeat this process four to six times. Relax and breath. Take long, deep, and slow breaths in through your nose and out of your mouth. Practice this breathing technique beforehand and put it into play when it comes time to get your injection. Tell the doctor about it. This goes a long way in helping you deal with this issue. Don’t feel embarrassed about it. We’ve seen it many times before, and we’ll do all we can to help you relax. In order to prepare your skin to receive your PRP treatment at optimal level, the doctor will run you through a minimally-invasive and relatively-painless process known as microneedling. This is usually done concurrently with the preparation of the PRP. WHAT ARE SOME OF THE SIDE EFFECTS OF MICRONEEDLING? Microneedling alone is not an injection, nor does it apply anything else to the surface. It is strictly designed to stimulate the skin’s production of collagen and other active biomolecules. However, if it is a vital point of preparation for the next part of the vampire facial. Microneedling has very few documented side effects if the treatment is done properly. Patients will commonly deal with minor skin irritation after a microneedling procedure. There will also likely be redness or even itchiness for a couple of days. These are perfectly normal things to see and shouldn’t be long lasting. If you’re experiencing bleeding, bruising, or excessive amounts of pain for a few days after your treatment, please contact your doctor. You are pregnant or believe you may be pregnant. You recently had some sort of radiation treatment. After the microneedling process is done and the PRP solution is ready, it is placed back onto your skin. The microneedling process allows your PRP to reach deeper into the skin and really give you the results you’re looking for. Another great benefit of a PRP treatment is that because it uses your own body’s plasma, it’s hypoallergenic. In a day an age where harmful chemicals are on the rise and allergic reactions abound, this particular benefit cannot be overstated. One of the most common questions we get about vampire facials is will I be able to contract HIV or any other bloodborne disease because of this treatment, and the answer is simply no. We handle your plasma in a controlled-environment and it won’t touch anything else. Plus, it’s your blood. Besides being a completely natural part of your body, plasma is made up of almost 95 percent water. The rest are proteins, glucose, hormones, carbon dioxide, and mineral ions. In many ways, it’s the most natural treatment we offer here at Modern Aesthetica. If you’re concerned about the effects of using your body’s own platelet-rich plasma for facial aesthetic treatments, don’t hesitate to call or contact our office to learn more. Modern Aesthetica’s staff will provide friendly advice in a non-judgmental atmosphere. After all, you’re almost certainly not the first one who’s come to us with these concerns. Vampire facials provide an immense amount of rejuvenating value to your face. They are designed to reverse all the common signs of aging on your face and neck. When you get a vampire facial done, it can reduce the amount of wrinkles and significantly enhance your skin tone. It can even prolong the effects of dermal facial fillers like Restylane or Juvederm. However, these facials aren’t just for those who are older. Someone who is young can benefit from a healthier appearance and even experience healing from scarring due to acne — which is a common problem among teenagers — by breaking up the scar tissue and stimulating deeper healing. One benefit we simply cannot stress enough is how natural this treatment is. By using your own body’s plasma, you aren’t injecting a foreign substance into your skin — like you would with Botox — and increasing your risk of an allergic reaction. HOW LONG WILL IT TAKE TO RECOVER FROM A VAMPIRE FACIAL? After a vampire facial you can typically expect your face to be red for about two to three days. The dryness might last up to five days. The great news is that within a few days you should see a noticeable healthy glow in your skin. However, it usually takes about four to six weeks for the collagen remodeling to fully take place. If you’re still experiencing these symptoms for longer than a week after a PRP facial, it’s worth making a call to your doctor. Again, if you experience any of the negative effects listed above after a vampire facial, reach out to a doctor right away. If you are dealing with stubborn acne scars or signs of aging, PRP therapy can be a great way to breathe new life into your skin and get your youthful glow to return once more. At Modern Aesthetica we offer top-quality facial aesthetic services to our clients in Santa Monica, Los Angeles, and beyond. In fact, clients come in from all over the country to our wellness clinic in order to get the care they need. In order to get the best results from your vampire facial, or any other PRP treatment, set up a free initial consultation with Dr. Daniel Moghadam and he can walk you through the process. Dr. Moghadam completed his fellowship with the American Academy of Anti-Aging and is a certified master injector. This enables him to provide a full range of aesthetic services and give Modern Aesthetica’s clients the personalized attention and wellness care plans that work for them. It is recommended that you get a vampire facial treatment multiple times with a gap of about four to six weeks in between in order to get maximum results. You can also combine a vampire facial with other treatments in order to maximize your results. Keep an eye out for our promotions in order to save even more on our anti-aging and aesthetic services.